Water absorbent bags are specifically design for removal of water from various applications. They can be used to remove water and moisture content from hydrocarbon as well to certain extent. 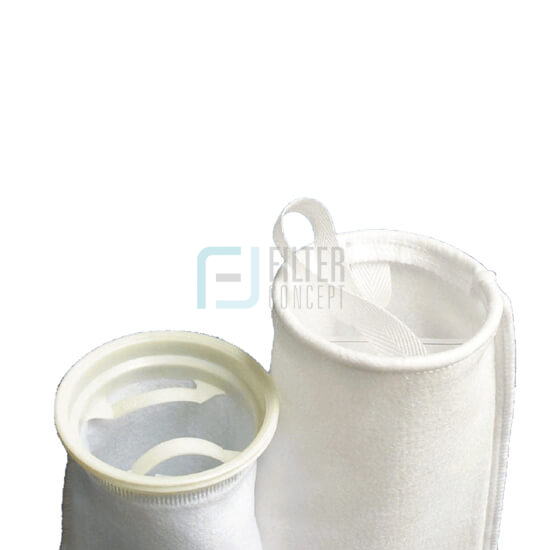 We have experienced that water absorbent bags are quite use full to removal of small amount of water droplets and moisture from finished level of hydrocarbons. They have been made with selective fiber media to capture water droplets and like normal felt bags they are fused for high strength and better durability. They have Polypropylene collar on top as standard design. Dual purpose : Not only removes water from oil, but also retains contaminants of 1, 5, 10, 25 and 50 microns. FCI SEM Matrix Series uses a new type of specially formulated and highly effective water absorbent. In its pure form, such absorbent is capable of absorbing water from oil up to 100 times of it own dry weight. However in its pure form, such water absorbent tends to be unstable. Once exposed, it quickly absorbs moisture from open air. To stabilize the water absorbent for commercial applications, we mix certain percentage of Polyester fiber into the water absorbent to formulate our unique FCI SEM Matrix media, which is capable of absorbing and retaining water content up to 50 times of its own dry weight. In addition to a standard line of FCI SEM Matrix bags, we will launch FCI SEM Designer filters simultaneously. Customers are encouraged to contact us with application specifications. As usual, we will custom make Designer FCI SEM filters that are tailored to meet each individual customers’ application requirements.